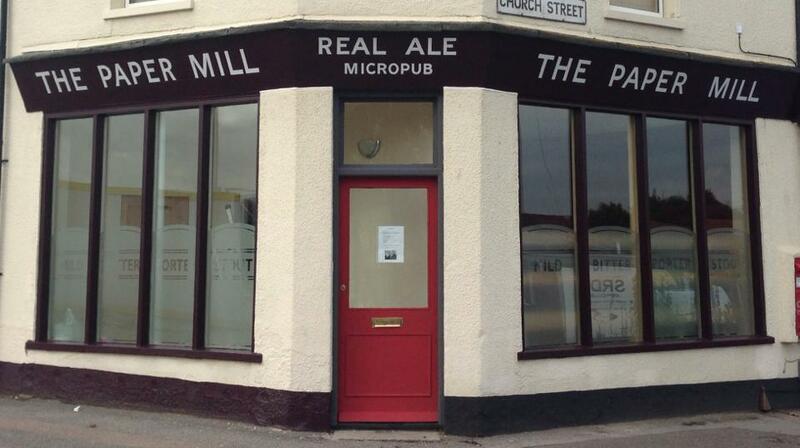 The Paper Mill is a micropub serving real ale and is situated on the corner of Charlotte Street and Church Street in central Sittingbourne, just a few minutes' walk from the new Morrisons supermarket and only a quick 8 minute walk from the railway station. Unlike a usual pub, a micropub, as the name suggests, is small and usually single-roomed. We serve only high-quality cask conditioned ales predominantly from local independent breweries, though we do sometimes serve similarly high quality made local cider and always have non-alcoholic drink available for any "designated driver"! We are very much in the style of an Ale House. You won't find any fruit machines, juke boxes, TVs or pool tables here, but you will find congenial hosts, a relaxed friendly atmosphere and good old conversation. Also unlike normal pubs, there is no actual bar. On the wall you will find a list of the ales we have available on the day with clearly marked prices and some information about each ale. You simply choose your ale, give your order to the landlord or landlady, take a seat and they will go and fetch your drink from the back and bring it to you. Now all you have to do is sit back, relax and enjoy your drink and the conversation.